You need an expert I.T Blueprint. Don’t accept anything less. Align yourself with first class, knowledgeable and prompt technology. Be confident that your technology is setup to never collapse, then get on with running your business. YOUR PROFESSIONAL SERVICES BUSINESS DESERVES WORLD CLASS I.T. SUPPORT. Be confident in your technology structure. Reliable. Secure. Fast. Ideal. Get in touch for 1st Class I.T. Your IT & Technology Specialists. Being a business leader, you will have seen dramatic changes to business in your time. Technology-wise, things are very different. And in order to keep up, leverage your business successfully, and just get on with running the day to day activities, you need an IT and technology system that is tough as nails. Thats why we specialise in working with CEO’s, CFO’s and Business Leaders, we understand your particular challenges, we know what to expect, and how to minimise risk and downtime, and make sure your productivity stay at an optimal level. Your time is precious and should be spent on your core business, not on stressing about your IT not working. That’s why you can rely on Wyntec. From ongoing technical support, IT support, network systems and assistance, and just finding the best possible, most fuss-free solution for your specific business requirements, Wyntec will make it easier for you. Because, really, you just want your IT to work around the clock so you can get on with running your business. Why Your IT Systems and Services are holding you back. We get contacted every day by Chief Financial Officers and Business Owners who are frustrated and overwhelmed by problems with the IT systems in their businesses. “Why does it always seem that I get one thing sorted, and another problem shows up and wastes my valuable time?” they say. To many business owners and C-Suite managers are losing valuable working time “putting out fires,” changing IT systems and retraining staff just because what they’re doing isn’t right for their particular business. Before you invest another second or more dollars in fixing, supporting or upgrading your IT you need to realise that a lot has changed in business over the last five years and it’s impacting your entire organisation’s productivity and profitability. The tech revolution has dramatically changed everything in our society. It’s just not the same world it was five short years ago. The nature, pace & demands of work have changed. Your Staff & Customers need to be helped not hindered by your IT infrastructure & systems. Technology is no longer a department in your business, it’s become the FOUNDATION on which every department depends. “Information Technology and business are becoming inextricably interwoven. Discover how to reduce cost, risk and stress by outsourcing your IT to a local company like Wyntec. In this technology revolution, your business doesn’t just use technology, it’s completely dependent on IT. Your entire operation is at the mercy of your IT hardware, software and services. If your IT goes down, your business goes down. Because of this we’ve found that many Business Owners and C-Suite managers can at times suffer from IT related stress caused by 3 fundamental issues in their business. IT is often seen as an annoying expense rather than a fundamental business foundation so many companies run on a mix of old & new systems, things don’t work well & they experience problems all the time! When your IT strategy is not aligned with your business goals and service delivery standards, IT becomes a frustrating “necessary evil” instead of the most productive and cost effective partner on your team. When businesses fail to proactively define, design and deploy the right IT support strategy, they spend their days “putting out fires” and getting frustrated by the lack of effectiveness and productivity. Poor IT always costs more! For over 10 years, we’ve been helping businesses to deliver outstanding products and services by providing them Stress Free IT strategy, support and services. Our services help your management and staff to get on with your core business functions without the normal hassles of IT that is mismatched, difficult to master and expensive to maintain. We’ll get your IT systems working with you instead of against you and help you to hit your business goals faster using the latest IT systems, software & cloud solutions. By taking a planned & proactive approach to IT, we’ll help everyone in your business to enjoy productive & meaningful work everyday, uninhibited by old ineffective IT systems.It’s time for Stress Free IT! We'll help you to design a complete IT system for every area of your business that will save you time and money. Discover A Key to Stress Free IT! The difference is now that IT is no longer just a department in your business, it’s become the foundation of your business. Don’t believe me? Just let me go and turn your internet off and we will see how long it takes for your business to stop! Is Your Technology Helping You Achieve Your Business Goals? Learn how do reach your business goals through the use of the right technology! For many businesses, be them financial, professional services or construction services, IT issues and breakdowns are the last thing their owners, C-suite executives and managers need. It’s confusing, and with deadlines looming, it’s even harder to know which option to choose. One thing they do know is that that they don’t need a break down of any sort to keep the business going. Our clients, however know what it means to experience “Stress Free IT”. That’s when they know that the Wyntec team will be on the case should a problem arise, and have everything running smoothly without causing further stress for them. It’s a feeling of confidence. The preparation is key – knowing which IT and technology strategies are right for your construction or building business so that risk and downtime is minimized, and that the business operations are maximized. If you want more time to run your business, and less time worrying about your IT, just get in touch. Build a stronger IT foundation today. Let us help you figure out what’s best for your business and what going to set you up for the future. We’ll design a strategy that will get you to where you want to go, quickly, easily & affordable. Get things back under control. No more fighting fires, and messing about. We’ll get your IT sorted once & for all. 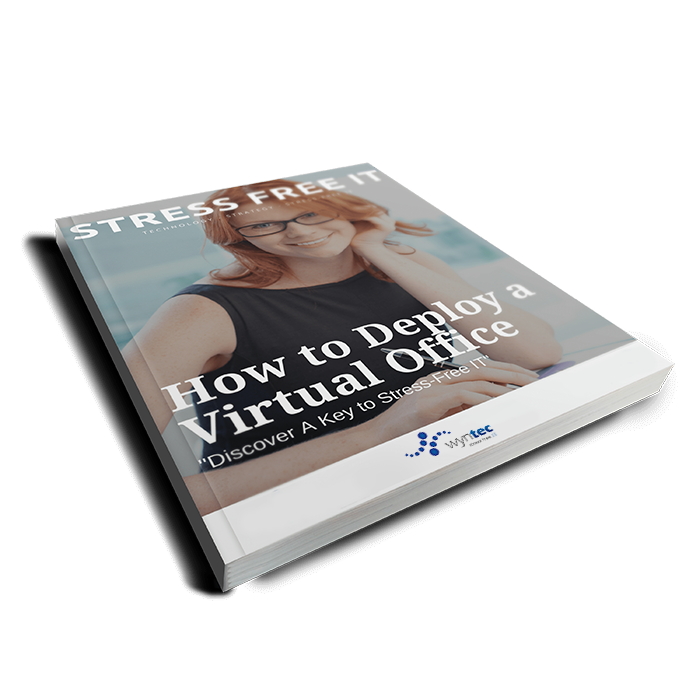 Discover the Key to Stress Free IT.